LIKE many Australians, Sue Price was appalled by this week’s harrowing footage of an international custody dispute playing out at Brisbane Airport. While most public criticism has centred on the Family Court and Australian Federal Police for forcing four sisters to return to Italy against their will, the Men’s Rights Agency director has set her sights on the mother at the centre of the controversy. “That (situation) was entirely her fault and creation,” Price said of Thursday’s happenings. “She deserves an Academy Award. had been sensible and controlled herself as a parent should do, it would have been much easier for the children. “The media has pandered to the mother by reacting to her theatrics and that’s made it worse. the airport as their distraught mother shouted to them was the latest chapter in a bitter and public custody battle. avoid a 20ll Family Court order to return to Italy, where they are the subject of a custody dispute. mother in 2010 for a one-month holiday and stayed on. lives, said the overwhelming public support for the girls’ mother reinforced how fathers were often unfairly treated in custody battles. aren’t portrayed as sympathetically as mothers … the media portray them as the bad guys. Hague Convention so the (custody) hearing could take place in their country of residence. Their great aunt yesterday said the family was now considering a legal challenge in the Italian courts. had largely been ignored in coverage of the case. his kids weren’t coming back to Italy?” he said. “It makes you cry at times when you’ve got a person on the phone who can’t see their kids even though they’ve got a court order in their hands. 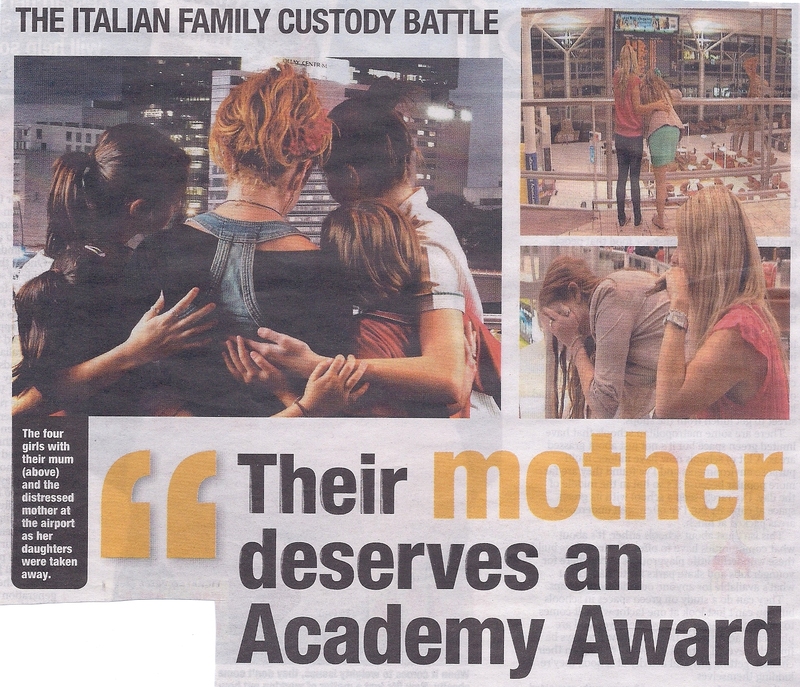 And the girls will need an Academy Award too by the end of this battle, thanks to this outragious mother for what she is putting these girls through and after seeing her behaviour. Why didn’t she go through the proper chanels and resolve the custody in Italy. She deserves to loose them now. I can imagine the lies that have been told. This poor father and his family in Italy obviously have been hurting but no one gives HIM media time. He is doing the right thing, he would protect his daughters from all this. Why can’t we listen to his side of the story? I have seen the damage first hand a lying mother can course. Welcome Elivince. We have been appalled by the mother’s, grandmothers and great grandmother’s behaviour. Thankfully the Australian Family Court decided to uphold the principles of the Hague Convention and return the girls to Italy. The next article in this saga from the American Fathers and Families website will interest you and many Australians. Hopefully, once this is distributed, the media and the mother’s cheer squad will think again. Your brother behaved impeccably in the face of unrelenting innuendo and accusation. Not once did he criticise the mother’s behaviour or her attempts to delay the return of the children. We all felt for him and wished we could do more to support him, but we did not wish to inflame the situation more by joining in the affray. with the link also to the Families and Fathers url. He goes on to detail further information about the mother’s and her family’s behaviour. We also received an email from the father’s sister. It’s on our site if you wish to read it. As a point of interest, I was at the Family Court on the day the final decision to return the girls to Italy was handed down and when talking to one of the female journalists afterwards, she expressed concern that she and her colleagues (who were gathered outside) felt that the media had created much of the drama and ensuing difficulties that had occurred, by supporting the mother without question. I was obviously pleased to hear that some self analaysis along those lines was taking place. Unfortunately, we see many instances of ‘different treatment’ of men and women in describing similar events. This gender-based treatment flows through to all levels of our society; the Family Court where fathers are often regarded as uneccessary in their children’s lives apart from providing financial support; government policy in regards to family, social welfare and education – father’s views are ignored; in sentencing where a man will, undoubtedly, receive a longer jail term for the same offence than a woman; and particularly in how the community views a man – especially with his children. Many fathers tell me of their acute discomfort when in a park or outdoor setting playing with their children – they are stared at, watched and generally regarded with suspicion. Some women have been reported as approaching the children to ask them if they are okay. Over the past thirty years men have been portrayed as the perpetrator and women the hapless victim! So much for feminism – clearly off the rails when one group of women casts another group as victims in order to raise funds/status for their own agenda.